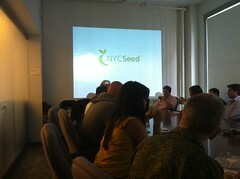 NYCSeed‘s managing director Owen Davis came by the Rose Tech Incubator this week to give a talk on what investors look for in startup’s. Some of the key points Owen mentioned that I took away from the talk are below. (NYCSeed only invests in the 5 NY borrows). To anyone doing a startup, “Time matters”. Owen mentioned that committing large amounts of time to R and D is a bad mistake. Timing has to be in your favor, things have to be aligned. Your technology and the timing is key. You can build something great but is there a demand for it? Owen recommends 2 person teams, I hear this magic number a lot, google, yahoo, etc. Startups with 2 founders is the magic number. It shows a demonstrations team work, difference in dynamic. With a team of two you have a sounding board. Another key thing is to have a prototype complete. Showing you have tech leads on as founders is the DNA of the company it is important. Moment by moment technology changes. Angels and VCs like to see a good sized market, show a clear path to revenue. Investors believe or don’t believe in the innovation you have. Some companies have pricing power, if coke raised it’s prices they would be ok.
Amazon charges more then others. Wholefoods charges much more then others. Having a good team culture is important. Be honest and be transparent that is what is important. A “good business” is not necessarily fundable. A lot of great biz that will be successful without funding. 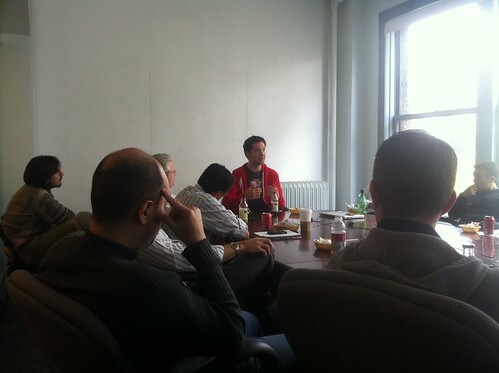 We were honored this week to have David Rose talking about the direction that companies are going. I took a few notes on what he had mentioned. David also mentioned that we should take a look at the books Wikinomic sand Three Moves Ahead a book by Bob Rice.